A recent study published in April 2015 and financed by the National Institute of Health aimed to investigate the link between vaccination and autism. Despite many earlier studies and scientific evidence, many people and internet activists continue to believe that a link between vaccination and autism truly does exist. Certain groups of peope have continued to blame the presence of mercury and other preservatives as the main perpetrators and responsible agents for causing autism-related symptoms in children. The Measles/Mumps/Rubella (MMR) vaccines are the ones who are being singled out, despite the wealth of scientific knowledge and studies having established that no link exists between vaccination and autism. Because of these ongoing beliefs, many parents are refusing to have their children vaccinated and these diseases are slowly reappearing in certain communities. 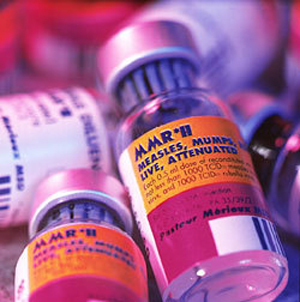 With this in mind, the NIH decided to finance a study in which more than 95 000 children vaccinated against MMR were included, irrespective of whether or not their siblings did present with Autism Spectrum Disorder (ASD). Results from this vast study show that no association exists between vaccination and autism: no increased risk was seen, irrespective of age, gender or presence of ASD in the family. The link between vaccination and autism has therefore been refuted by yet another another study.